More than two billion tons of cargo pass through ports and waterways annually in the United States. Many ports rely on gamma-ray scanners, based on radioactive isotopes such as cobalt-60, to screen cargo for nuclear materials or weapons. But an increasing number are turning to high-energy X-rays generated by particle accelerators to keep ports safe and prevent contraband from entering the country. X-rays reveal the basic shapes of objects inside a container. The denser the object, the fewer X-rays get through. Scanners that use beams of accelerated electrons to produce the X-rays achieve much higher energies, up to 6 million electronvolts. These high-energy X-rays penetrate deeper and give screeners more information about the nature of the cargo. Heres how such a system works at a port or border crossing: A truck pulls up to a scanning station that looks like a car wash. 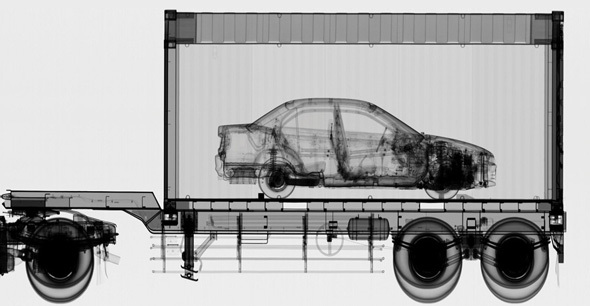 The driver gets out of the truck; the scanner moves up and down the container; and a detector on the other side of the truck records the X-rays that have passed through the truck and its cargo, revealing whats inside. Alternatively, a mobile scanning system mounted on a truck can pull right up to cargo that needs to be inspected. On average, it takes 30 seconds to scan a shipping container. When all 5000 containers on a ship need to be unloaded in a matter of hours, every minute counts. "The flow of commerce is a big concern," says William Reed of Varian, a California-based company that manufactures particle accelerators for national security and medicine. "Ports in the US are very crowded, and the queuing process for scanning is a big logistical issue." Ports in Africa, Russia, Saudi Arabia, and the United Kingdom have been early adopters of this technology; and as high-energy scanning systems become smaller and more efficient, they are coming to US ports as well. Meanwhile, scientists at national laboratories, universities, and corporations are exploring other methods for scanning cargo. One system, called "neutron interrogation," is being used to scan trucks entering Idaho National Laboratory. It starts with pulses of neutrons from a particle accelerator. Neutrons react with the atomic nuclei of materials, which respond by giving off gamma rays. Radioactive materials have their own distinctive gamma-ray signatures. In a neutron scanner, the neutron pulses "interrogate" the container. A detector records the resulting gamma rays, and computer analysis determines if the gamma-ray signatures of materials in the cargo look threatening or benign. "Neutrons give you a certain level of material specificity that X-rays cannot provide," says Dan Strellis of Rapiscan Laboratories in California, which researches and develops X-ray and neutron-based screening technologies for security applications. "As opposed to looking at shapes and relying on the screener, you can use the physics of the neutron to give you the answer."